With my usual swift transition from thought to action, it has taken me a little over two years to get round to revisiting the Thistle Sandwich Bar to try their breakfast rolls. 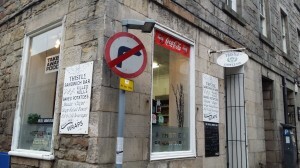 Nestled on the corner of Thistle Street, the place covers the more humble end of the market on one of Edinburgh finest restaurant streets. It’s just a wee caff, more set up for takeaway custom, but with a table or two should sitting in take your fancy. The counter women are tremendous characters. I was in the shop for all of three minutes (service is quick) but that was plenty of time for a succession of warm pleasantries to be exchanged. 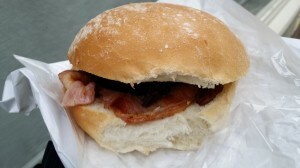 My choice for today was a bacon and black pudding roll. Brown sauce was applied as per my usual practice. With photos snapped, I ate as I walked. The roll was up there with the best I’ve had in the city. The black pudding had a wonderfully soft texture to it and was richly tasty. The bacon was profuse and flavour packed. It was a truly great item. So overall, my suspicions from January 2012 were indeed correct: the Thistle Sandwich Bar does indeed do excellent breakfast rolls. You should go and sample them at your earliest convenience. Meanwhile, I will try to improve my turnaround time with such hunches in the future.